Some auto insurance companies try to convince you to pay your premium with a credit card, and will even offer incentives for your cooperation. While I generally oppose the use of credit cards for any purpose where it isn’t absolutely necessary, there’s a strong case to be made for using them to pay your annual car insurance premium. To be clear, we’re not talking merely about allowing your auto insurance company to make monthly debit charges to your credit card to pay the premium in installments, but to use the card to pay the entire balance with one payment. That’s where the advantages kick in. 1. You might get premium discounts. Auto insurance companies will usually offer you a discount if you pay your entire premium up front. Or more to the point, you will not have to pay the add-on fee you will have to pay with a monthly installment plan. But some will give you an additional discount if you pay the entire balance up front with your credit card. My own auto insurance company offered me a 12% discount if I pay the full balance on my credit card. That seems like an awfully generous discount, but it must make sense for the auto insurance companies. For one thing, paying with a credit card means the company will get the full premium immediately, and that always has value for insurance companies. For another, there’s no waiting for a check to clear, or dealing with the risk of bounced checks. Credit card payments ensure prompt, seamless cash flow to the insurance company. As impressive as the discount seems to be, it has to be measured against the interest rate carry charges of adding the annual premium to your credit card balance. If the interest rate being charged on your credit card is 12%, the 12% discount offered by the auto insurance company will work in your favor only if you pay the entire balance off in something less than 12 months. If the balance is still sitting out there in full in one year, taking the discount for the annual payment will begin to work against you. 2. You could get credit card rewards. Another possible benefit of paying the premium with your credit card is the possibility of earning credit card rewards. This will vary depending upon the rewards program you have with your credit card issuer. Some may permit you to accumulate rewards based on bill payments while others don’t. The benefit isn’t enormous either. You may be getting a reward equal to no more than 1% or 2% of the amount of the payment made. Still, that can be significant if your annual auto insurance premium is several thousand dollars. And that’s not hard to have if you have multiple drivers and cars listed under the same policy. 3. You’ll have one less bill to pay. Paying bills is stressful, not the least of which because after you’re done paying this month’s bills, you can rest only in the uncomfortable knowledge that you will be doing the same thing next month, the month after that, and every month for the rest of your life. But by paying the full annual premium at one time, you are eliminating at least one bill from the roll of bills you have to pay every month. Though paying a large annual premium will cause a disturbance in your budget at the time you make the payment, it will improve your cash flow for the rest of the year. If you are a saver, this won’t be a problem. Having one less bill each month means that much more money to save. When the next annual premium comes due, you’ll be ready with the cash to take care of it – or to pay off the credit card balance right after using it to pay your auto insurance bill. 4. You’ll have no risk of a missed payment. A soft benefit of paying the premium upfront is that there is virtually zero risk of missing a monthly payment. This can be especially important when it comes to insurance. Insurance is one of those products that can lapse if you don’t make your payments on time. If that happens, there’s a possibility that the insurance company will file a report with the state indicating that you no longer have insurance through their company. This is easily remedied just by making your payment. But that could expose you to the risk that you may one day be pulled over by a police officer whose records will show that you are not currently carrying proper auto insurance coverage. And then you’ll have the courts to deal with. Admittedly this is an unlikely scenario, but it is a possibility and it does happen to people all the time. The one-time payment, however, will make this a non-issue in your life. If you do choose to use a credit card to pay your entire auto insurance premium at one time, just be sure that you pay off the charge as quickly as possible. Obviously it will be best to pay it off as soon as the credit card bill comes due. But as we saw in our 12% example above, you need to calculate at what point monthly interest charges begin costing you more than what you save with the upfront premium discount. That needs to be your drop dead point, or the point after which using your credit card to pay the premium is no longer working to your advantage. 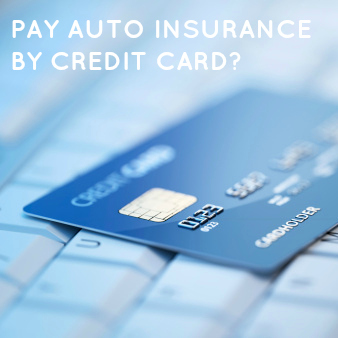 The entire purpose of paying your auto insurance premium with your credit card is to gain a significant financial advantage. If you are unable to get the full benefit of that, then the entire arrangement is best avoided. Do you ever pay your entire auto insurance premium using a credit card? Leave a comment with your thoughts! My husband and I have done it this way for many years. We figured up how much all of our “yearly” type bills are, i.e Auto insurance, property insurance, license/tag fees, property taxes etc. We then divide that amount by 12, and put that amount of money into savings every month plus a little more. When the bills come due we pay them with a credit card to get any discounts/rewards we might get, then immediately pay off the credit card from our savings. That’s the very best way to take advantage of the credit card benefit. You get the benefit, but none of the backend aggravation. It seems contrary to what I think, given that they have to pay more fees to take a credit card, but if they offer it, it doesn’t sound like a bad idea for the reasons you mentioned. They key to the whole thing is paying off the charge shortly after incuring the charge. No credit card fees!